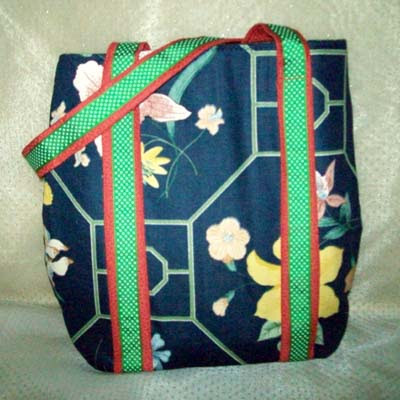 Finished the 2nd purse from this pattern, View F. Learned a bit more. Specifically, I have to put more attention tot he fabric placement. This particular fabric has a couple great flowers which I've partially covered with the straps. Also, the pattern only calls for seam stitching, which just doesn't seem enough for a purse of this size and potential functionality. So, top seamed everything possible, and double seamed what wasn't. I know one of the things I hate in a purse is when the lining gets rips and the stuff disappears into the 'inbetween land'. So, all the lining is definitely overstitched. Overall, this purse turned out well. Although I want to try a couple of the other variations, I'm going to move on to another pattern and return to this later ... need to purchase some handles.